The Copper Door features mid-western Black Angus steaks, fresh seafood and a well-chosen selection of quality wines. 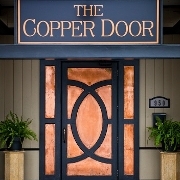 The Copper Door offers guests two intimate dining rooms and a full bar. Join us for dinner Tuesday through Saturday evenings – and don’t miss Prime Rib Wednesdays! We also offer wine pairing dinners throughout the year – join our email club to stay informed! The dress code is smart casual to formal – nice jeans or slacks paired with a top or collared shirt would be acceptable. We ask that gentlemen remove their hats indoors. The restaurant is also available for private parties and special events. Call or email info@thecopperdoor.com for details. For donation and media requests, please contact ada@thecopperdoor.com.